Geometric Programming is currently of interest in CAD (Computer Aided Design) and related areas such as computer graphics, modeling and animation, scientific simulation and robotics. A growing interest towards gemotric programming is forecast in the next few years with respect to market specific CAD applications (e.g. for architecture and mechanical CAD) and web-based collaborative design environments. PLaSM is a general purpose functional language to compute with geometry which the authors use throughout their text. The PLaSM language output produces VRML (Virtual Reality Modelling Language) files which are used to create virtual worlds. PLaSM blends the powerful algebraic approach to programming developed at IBM research, with a dimension-independent approach to geometric data structures and algorithms, This book shows that such geometric code can be surprisingly compact and easy to write. 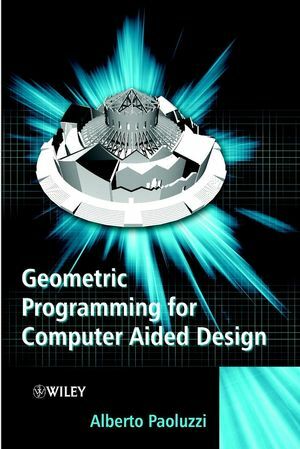 It begins by introducing the basic programming with PLaSM and algebraic and geometric foundations of shape modeling, the foundations of computer graphics, solid modeling and geometric modeling of manifolds follows and finally discusses the application of geometric programming. For each topic, the mathematics is given, together with the PLaSM implementation (usually with a few lines of readable code) and some worked examples. ALBERTO PAOLUZZI, Department of Computer Science, Universita Roma Tre, Italy. Introduction to FL and PlaSM. Appendix A: Definition of MyFont. PLaSM Homepage Visit the PLaSM Homepage to download the FREE software discussed in the book.